Are Investors Betting On More Help From Fed? As the markets started this morning, they hit 100+ on the Dow almost immediately. Is this something that could last? Fed Chairman Ben Bernanke scheduled a press conference this afternoon to discuss what the Fed is going to do to help, but is it too late? Many investors are walking away from the market as they are very afraid. However, now could be the best time to get into the market. With the market estimated at 35% undervalued, why not? 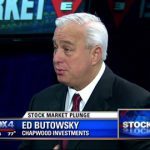 Ed Butowsky, managing partner of Chapwood Investment Management, joins Fox Business to examine the investor sentiment and how to react to the market.